This 13ft Trampoline Enclosure (Ref: 155115) is designed to enclose our 13ft Trampoline (Ref: 155116), sold separately. This 13ft Trampoline Enclosure is made to fit our 13ft Trampoline (Ref: 155116), not included - sold separately. It features 8 padded support poles and a safety net designed to protect trampoline users. 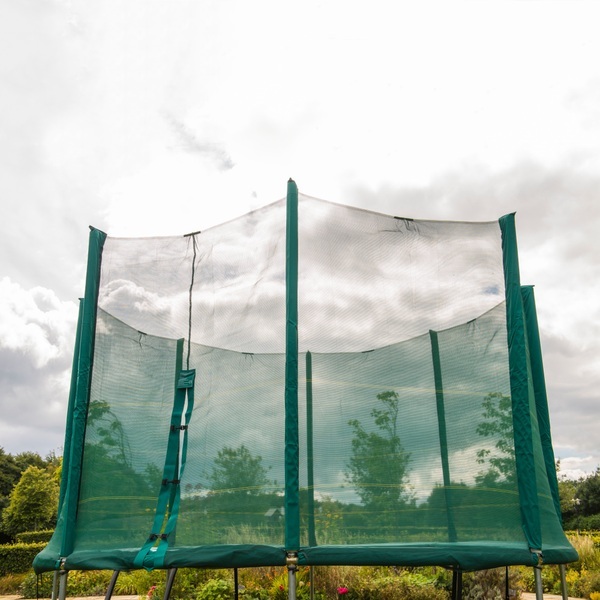 Unlike the enclosures of most other trampolines, our enclosures are designed to fit around the outside of the trampoline's perimeter, rather than the inside perimeter. As such, they don't take up any extra play space. This maximises the amount of room available for trampoline users to bounce in. The safety net of the 13ft Trampoline Enclosure is weather proof, so it can last for longer out in the elements. Using a trampoline enclosure will keep your bouncers safe while they are having fun on the trampoline. It helps to prevent them from falling or bouncing off the trampoline onto the ground and reduces any risk of accidents. An enclosure is an important part of trampoline safety. This 13ft Trampoline Enclosure includes the poles and safety net only. The poles and the safety net area cheerful green that blends well with garden spaces and co-ordinates with the padding of our 13ft Trampoline (Ref: 155116), sold separately. The trampoline, the ladder and the tie down kit are all sold separately.